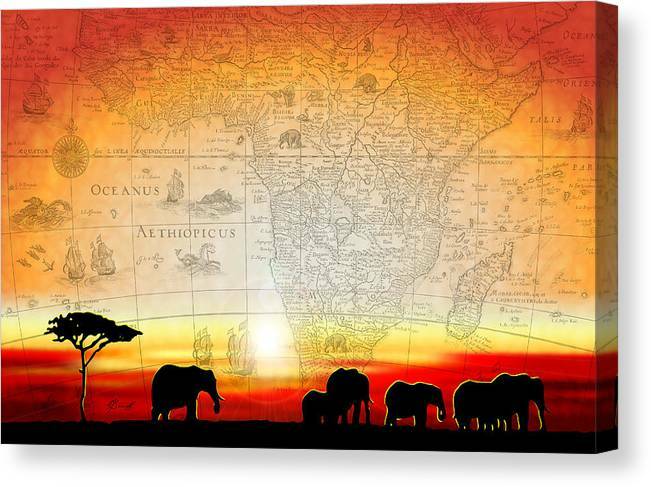 Old World Africa Warm Sunset by Dana Bennett - 12.000" x 7.750"
Old World Africa Warm Sunset canvas print by Dana Bennett. Bring your artwork to life with the texture and depth of a stretched canvas print. Your image gets printed onto one of our premium canvases and then stretched on a wooden frame of 1.5" x 1.5" stretcher bars (gallery wrap) or 5/8" x 5/8" stretcher bars (museum wrap). Your canvas print will be delivered to you "ready to hang" with pre-attached hanging wire, mounting hooks, and nails. There are no comments for Old World Africa Warm Sunset. Click here to post the first comment. 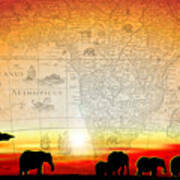 This graphic art was for a South Africa Safari travel destination. 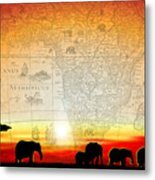 I like the high contrast from the dark silhouette of the elephants against the soft flowing colors of the sunset. 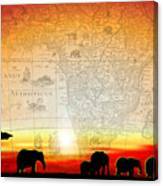 The old map of Africa gives the art meaning and a sense of history. The original was the full color version of the sunset. The warm sunset version was the second design that became the final artwork. Both give off there own unique feelings, cool & colorful or warm & rich. I also created a neutral black and white version and a antique dusty version.